An honored member of WCBC recently passed. This is a posting in memory of his contributions to the Club. If you knew Harry, please feel free to post Your Thoughts by submitting a comment sharing your fond memories of Harry. 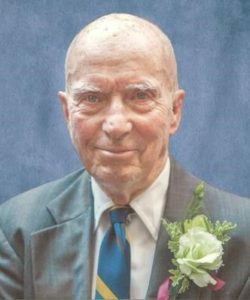 Paraphrased from his obituary – Harry Byron Russell, 92, passed away peacefully Feb. 2nd, 2018 at Cokesbury Village in Hockessin with his loving family by his side. In his 60s, Harry developed a passion for group long distance bike tours all over the country and was a member of White Clay Bicycle Club for 20 years. Friends are invited to a celebration of life for Harry on Friday February 16th at 11 AM in the Cokesbury auditorium. I did not know Harry, but from stories shared by members that did know him I found out that Harry was a very active member of the WCBC. Before the Club owned a trailer, he stored everything needed for the major events in his business’ warehouse, loading up his extended van and transporting the majority of items to and from the event’s location. He led rides, was great riding companion and organized the Double Century event (from New Castle County to Rehoboth and back in a day) for years and the last DelMarVa tour. He also guided the Club by assuming the role of Vice President in 1997. To thank Harry for what he did for the Club, he was awarded a “Lifetime Membership” by White Clay Bicycle Club. Harry was a wonderful guy and a great cyclist. Harry and I led the MS rides together for many years We never went too fast or too slow but just right to keep the group together and enjoy the ride. He was always patient and kind no matter what happened. Ready to help anyone and he was a great coach for me and has kept me riding ever since. Not only was Harry a really nice man and a lot of fun to ride with, he also had a competitive side that a lot of people didn’t know. He participated in the Delaware Senior Olympics for a number of years and to this day he still holds the State record in the mens 75-79 20km and 40km road races, and mens 80-84 5km and 10km time trials, proving you’re never to old to race! Two fond memories regarding Harry’s love of multi-day tours and long distance riding come to mind: 1) His favorite annual tour was the Florida Bicycle Safari held every year in April. Harry had a big following at the Safari for his riding tenacity, and although he no longer rode all the long distance options on the tour every day (he had just turned 80), his Florida riding buddies still affectionately referred to him as the “DELAWARE DESTROYER”; and 2) At the start of the Shorefire one August in the early 2000’s, Harry was coaching an anxious young woman on how she should approach her 1st century. The strategy, he explained, was to take short rest stops in the last half of the ride as needed. If you took a quick stop to recharge, and then rode 10 miles before your next break, and so on, before you knew it you’d have your century. After all, he said, “Even your Grandmother can ride 10 miles”.